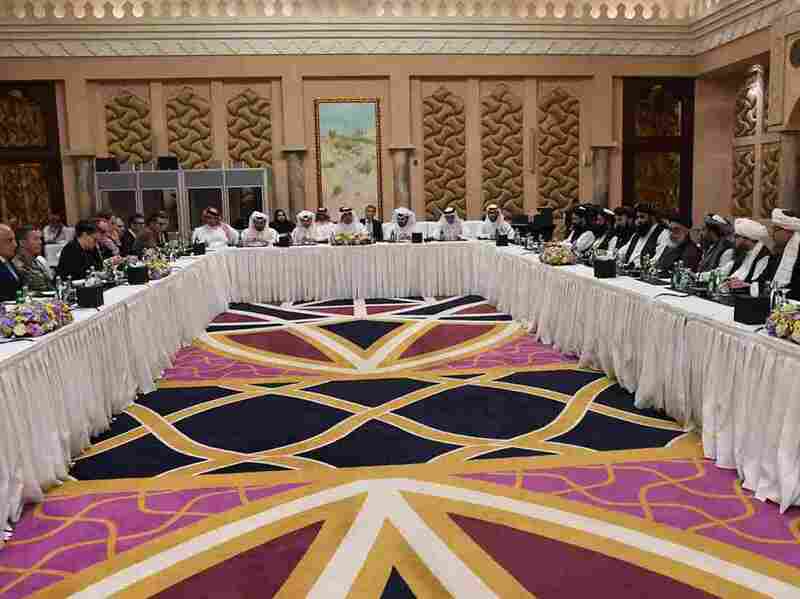 U.S.-Taliban Peace Process: Afghan Women And Youth Say 'This Is Not The Way' Afghan women and young people say the peace negotiations exclude their wants and needs. "The U.S. is negotiating with a group that's notorious for denying women basic human rights," says one activist. U.S. and Taliban negotiators meet in Doha, Qatar, on Feb. 26. In recent weeks, thousands of women and young people in Afghanistan as well as Afghans living abroad have been protesting and speaking out against peace talks taking place between the U.S. and the Taliban. Activists say that the views of the Taliban — whose harsh rule from 1996 to 2001 was notorious for repression of women — do not reflect the views and needs of Afghan people. They fear a Taliban return to power will undermine the progress that the country has worked to build since the regime fell nearly two decades ago. In February, a group called Afghan Women for Peace, along with the office of Afghan first lady Rula Ghani and other groups, organized a jirga, or tribal council, that brought together over 3,500 Afghan women from the country's 34 provinces to air their views, concerns and suggestions for the peace process, which so far has largely excluded women — as well as the Afghan government itself. 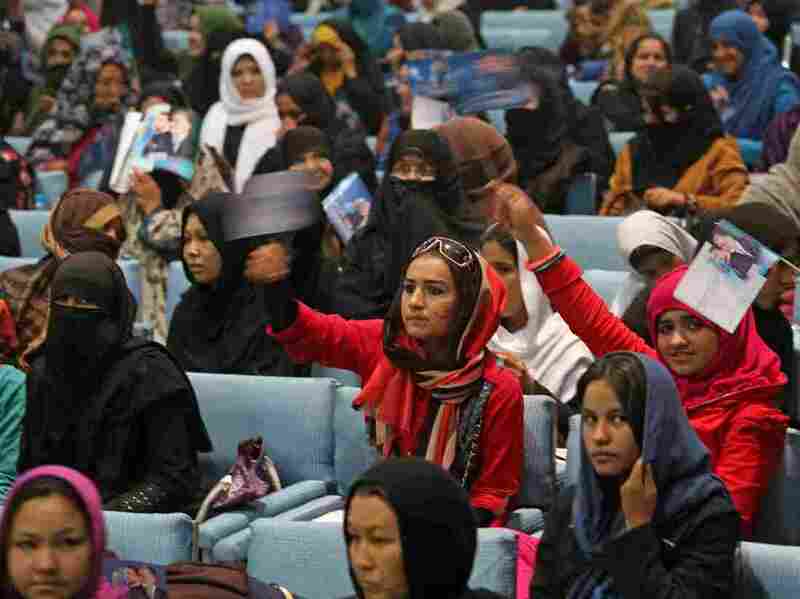 In their province-by-province statements, posted on Twitter, the women have emphasized the need for education, justice, economic opportunity and representation on Afghanistan's negotiating team. Opinion: As U.S. Seeks To Withdraw Troops, What About Afghanistan's Women? Another group, called Time4RealPeace — which includes Afghan women and youth, civil society groups and activists — staged a protest last week at the U.S. Embassy in London and released an open letter urging for a "peace process [that] reaffirms and protects our constitutional rights, interests and democracy." The letter was signed by more than 600 Afghan women and 30 international figures, including Nobel Peace Prize laureates, authors Margaret Atwood, Neil Gaiman and Khaled Hosseini and activists including Gloria Steinem and Eve Ensler. Zarlasht Halaimzai, 37, a co-founder of Time4RealPeace, says her group started in January on the heels of U.S-Taliban peace negotiations in Doha, Qatar, to help Afghan women and young people voice their hopes and concerns. "Everyone we talk to just wants to live their life in peace," she tells NPR. "We want peace. This is not the way." The group has begun collecting video statements of what peace means to women and young people in Afghanistan and is posting them on its Facebook page. One woman, Asifa Saadat, said peace means that young people will be more encouraged to stay and work in Afghanistan, instead of finding opportunities outside the country. A young man, Ramiz Bakhtiar, said peace means having open spaces for debate, where all voices can be included. For Halaimzai, who has spent most of her life outside her native Afghanistan, peace has meant access to opportunity and a chance to help others. She was 11 when her family fled Kabul during Afghanistan's civil war. They eventually settled in the U.K., where she was educated. She is a 2018 fellow of the Obama Foundation and the co-founder and director of Refugee Trauma Initiative, a nonprofit that provides psychological assistance to refugees, including Afghans, stranded in Greece. She spoke from northern Greece with NPR about the hopes of young people and women in Afghanistan — and the progress that the country has made since 2001. This interview has been edited for length and clarity. Why are the Afghans you're in touch with unhappy about the current peace negotiations between the U.S. and the Taliban? The U.S. is negotiating with a group that's notorious for denying women basic human rights. [Women] are concerned that constitutional rights to health care and education will be denied. At the moment, the Afghan Constitution protects women's rights. [The prospect of losing rights] is something that's really alarming — not just for Afghan women but for anyone who cares about women's rights. How would Afghans like the peace process to be negotiated instead? Elected representatives of the Afghan people should lead this process. Afghanistan has a young and fragile democracy, and it's something that Afghans have paid for with their lives. Excluding the government from the peace process means you're undermining it. Peace and security should not come at the expense of democracy. It's a false choice for the [U.S. and the Taliban] to say, "If you want peace, then you will accept our terms." It's not viable. What do the Afghans whom you've spoken to want out of this peace process? Everyone we talk to just wants to live their life in peace — be able to do ordinary things we all want to do, like go to work, send our kids to school, do our grocery shopping — and know we'll be safe. What was life like for women who lived under Taliban rule? Women couldn't go out of their homes without a male guardian, couldn't work, couldn't go to school, were subjected to these tyrannical, extremist rules. 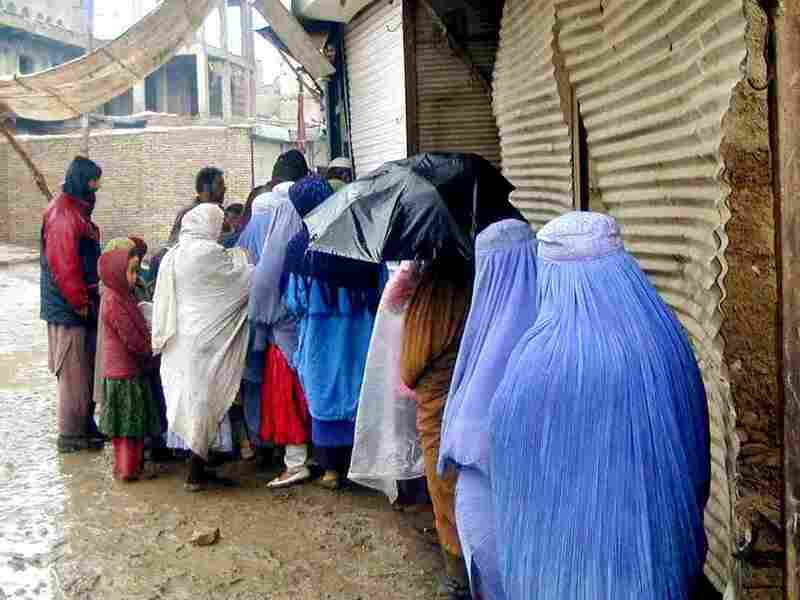 Afghan women wait in line to get bread at subsidized rates at a World Food Program-run bakery in Kabul in 2000. You say that Afghanistan has made huge strides over the last couple of decades. How so? It's hard for Americans to see what's been done, but there's been a lot of progress. When my family left during Afghanistan's civil war in 1992, Kabul was being bombed by thousands of rockets. I visited Afghanistan again in 2011, and it was an emotional experience. What was very clear is that Afghan society has changed. There is access to information and technology. It went from being completely disconnected from the world — before we fled, we couldn't even send letters — and when I returned, everyone had a mobile phone, Facebook profiles, Twitter. It's become a vibrant space for a lot of young people, entrepreneurs. It's a totally different country. And how has it changed for women? Now women make up a large percentage of those who are enrolled in school and university. A significant proportion of lecturers are women. The proportion of women representing the public in the parliament is higher than in the U.S. It's night and day. Female supporters of Afghan vice presidential candidate Habiba Sarabi attend a campaign rally for women in Kabul in 2014. What kind of response has there been since Time4RealPeace published its letter on Feb. 26? We have not heard from the U.S. government yet. We're hoping to speak directly to [them] about what's going on and see if we can advocate directly to the people who are making decisions. We call on the U.S. not to trade human rights for a quick withdrawal. We hope to build our movement on social media. A lot of young people have been contacting us and sending us videos. Are they saying anything surprising? There seems to be quite a consensus about what's going on. I thought it would be different. Afghanistan is a rural society, and there are lots of different views. But that's not been the case. They're saying they want peace that's just and inclusive. I've been most been surprised by that.